Yesterday I found tracks in Scarlett’s sandpit and tentatively identified them as coming from a mouse. Well, I was wrong. Not the first time, won’t be the last either. The tail drag was the clue, but I didn’t think it through enough. One animal consistently leaves a tail drag – a lizard. I thought about this, but I ruled out a lizard as the source of the tracks because the tail drag was too small. Lizards don’t just drag their tails, they walk with their legs sprawled so their whole body drags on the ground. This means that their footprints are spread wider than the body and that they leave a fairly broad drag mark. In other words, like my tracks, but smaller. I should have paid more attention to the shape of the trail, and less to its size. Let me pose the question: what leaves tracks like a lizard, only smaller? The answer: a small lizard. Obvious really, in hindsight. The tracks were made by a small lizard. How can I be so confident now? Well, I found the poor little chap in the sandpit this morning, dead. It’s a Common Lizard, I think (slightly less common now…) and only a tiny one. He’d obviously climbed in and couldn’t climb out up the smooth sides. It was a hot day, and he must have succumbed to the heat. Despite Scarlett and I playing in the sand for half an hour yesterday, we didn’t see him. Perfectly obvious, with hindsight. The lesson for me is to think through possibilities when tracking, not make assumptions. I may be wrong, but looks like a common newt to me. 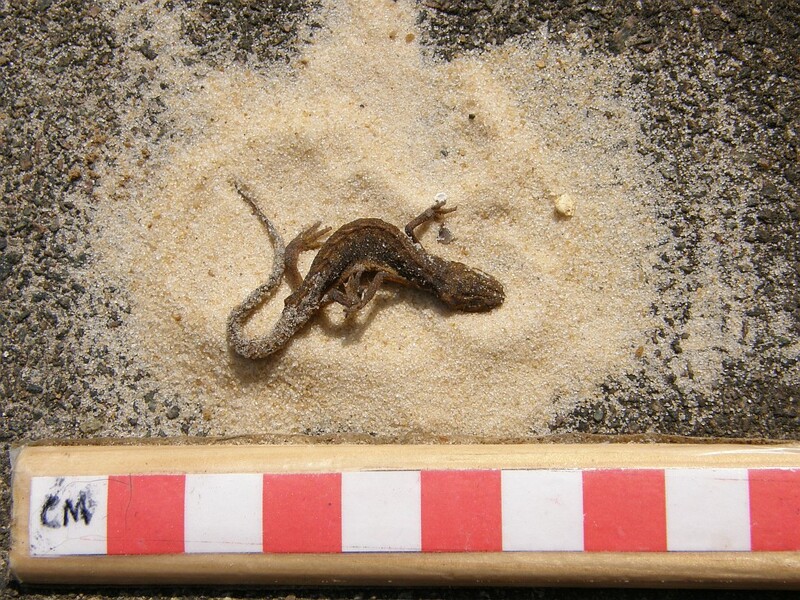 Looks very dessicated and has quite short toes with no visible nails, unlike the lizards feet which are long toed with noticeable nails. It is perfectly possible that this was a common newt. We have them in our neighbour’s pond, so they’re in the area. Of course, this means that I have been wrong about this whole thing twice in as many days, which is something of a record, even for me. Still, it’s all part of learning. I’m not an expert on lizards and newts, so I was going by the illustrations in my (informative and useful but fairly basic) Reader’s Digest book of Animals and trying to apply them to a dried-out little 3cm corpse. Its rough skin made me think of lizards, but you’re right, it could be the dessication. Thanks for the tip about the nails. If the nails are the distinguishing feature then that gives me something to work on. I will retrieve the poor little chap and have a good look with a hand lens and see what I can find. Actually, I’m not at all displeased. I do like a good wildlife mystery, especially one in my own garden. The bigger mystery is how did it get out of the sand pit when you first noticed the tracks, but couldn’t get out when it died? I have a full team of detectives on standby if you need assistance with this one! BTW, the rear feet do look like they are slightly webbed, although it’s difficult to tell by the photo. The feet tracks in the sand are quite broad as well. All this in hindsight. I would have said lizzard as well. The definitive feature of course, between reptile or amphibian, is whether or not the poor little fella has got scales! 100% Male smooth newt, Paul Hudson ,licenced Herpetologist, breeder of sand lizards for reintroduction programes. I have been wrong about this particular beastie so many times that it is good to get a definite I.D. The sandpit has been free for a while, so hopefully the newts are hibernating. They do do that, don’t they?